YongKang Beef Noodle Soup is an old time beef ramen shop in Taipei, also located on the famous YongKang road right next to another famous beef noodles restaurant LaoZhang. 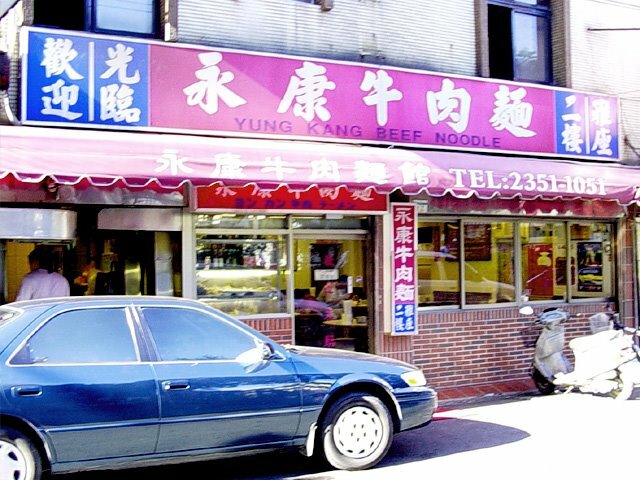 YongKang started out as a food stand in the near by park, but even as a decent sized restaurant today it still has the same signature beef noodles that made it so popular some 50 years ago. On my trip I ordered the 紅焼牛肉麺 (red roasted beef noodle soup). 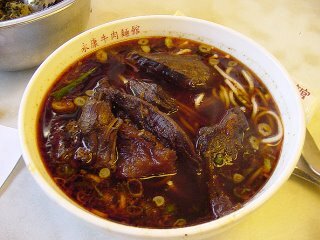 The Soup - is a beef broth made from simmering both the meat and bone for a good half od the day with many standard Chinese herbs and spices. YongKang differs from other beef noodles because they use 豆瓣醤 (douban sauce) to add flavor and spiciness to the soup. Douban sauce (トウバンジャン in Japanese) is a Chinese red miso paste made from fermented fava beans mixed with chopped red chili peppers. There is also a few drops of chile oil on the soup but it isn't too spicy. The Noodles - are thin straight noodles, cooked slightly on the soft side but still chewy and delicious. The Toppings - are large, thick slices of tender cooked beef and a few slices of green onions. There is also a big bowl of 酸菜 (suan cai) Chinese pickled greens on every table for you to pile as much as you want onto your noodles. The pickled greens are sour and salty and go really well with the soup. Overall - a very delicious beef noodle soup that I recommend to everybody. The soup is rich with flavor and aroma of the different spices without being to salty or heavy. I also think the balance of Chinese spices here is more accpetable for people from overseas. Though YongKang didn't score in the top three of the Beef Noodle Soup competition in Taiwan, it is still one of the best ramen experiences in Taiwan and worth checking out if you are in town.